PETER SENIOR has never been one to shirk the hard yards and has fittingly set himself up for what could be a crowning final season on the US Champions Tour. The 56 year old couldn’t have had a much better return home in 2015 than his Masters winning Aussie summer but that success is bookended by situations requiring Senior to display his legendary fighting qualities. We first caught up with Senior shortly after he returned to Australia after what had been his sixth year on the lucrative American over 50’s circuit. Senior was playing in the Australian Senior PGA Championship at the Richmond Golf Club in Western Sydney and after what many saw as two comparatively lean years in the US was in a surprisingly buoyant mood. He’d missed qualifying for the tour’s season ending Charles Schwab Cup Championship two years in a row but wasn’t showing any signs of disappointment. Instead, he detailed the long battle he had gone through to even complete the 2014 season and qualify for 2015. “I did my shoulder in August  and had to play the last eight events hitting it 180 yards off the tee,” Senior explained. Not an easy cross to bear for a pro golfer playing alongside some of the game’s all time greats. “I had no tour status in America [at that stage] so if I didn’t finish inside the top 50 I wouldn’t be able to go back unless I went to the players school and the way my shoulder was I couldn’t go back to the player school anyway. So I just went through the last eight tournaments, finished about 50th every week and managed to finish 44th overall, which got me enough tournaments [in 2015]. Senior had shoulder surgery at home that Christmas and said he was “a bit slow” starting the 2015 season. To illustrate, he finished T67 in his first event and T7 in his final appearance – a rather good summary of his season. “I missed seven tournaments but did enough to get me fully exempt for . I finished 35th which will get me into everything except two events,” he said. Senior went very close to winning that that week in Richmond, narrowly defeated by an evergreen Rodger Davis in a three man playoff that included Mike Harwood. The following week he was due in Huntingdale for the Australian Masters and was quietly confident about his chances. He of course did exceptionally well, recording an historic win that had Melbourne golf fans enraptured. Famously, it completed a “Triple Crown” of Australia’s three major championships in his 50’s. Senior was still buzzing the next week when he was about to contest the Australian Open, an event he won for the second time in 2012. Senior knew enough about his own game to forecast that the Australian Open and Australian PGA Championship courses at The Australian and Royal Pines would favour the longer hitters and that he didn’t have much of a chance. He proved correct in that assessment, missing both cuts, but went on to narrowly miss winning the Australian Legends Championship at Byron Bay in another playoff; then won the inaugural Sunshine Coast Masters, the last event of the 2015 E-Z-GO PGA Legends Tour. And that brings us to Senior’s next challenge. After some 28 years that event was Senior’s last with a long putter. 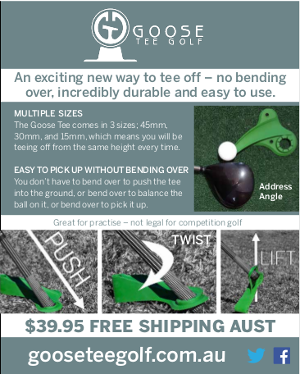 When the new no anchoring rule was first announced in 2012 we spoke to Senior in Sydney and he ventured it would probably mean 2015 would be his last year of professional golf. At Richmond last year he laughed at his own previous suggestion he would be hanging out the “Gone Fishing” sign. “I have always been a good putter so it shouldn’t worry me at all,” he said. By the Australian Open he had had a chance to talk to another affected Aussie about the new rule. But whatever happens with the short stick this season – and everyone knows he will battle to make it work – Senior was adamant that 2016 would be his final year of international golf. “I’m just tired of being away from home,” he said. “For nearly 40 years I’ve been travelling. I ‘m really happy I had my wife and my son with me every week, but if that wasn’t the case I wouldn’t be playing. So here’s hoping in his seventh and final year on the Champions Tour Senior can record that first elusive win. It would only be fitting having gone so close so many times. “I know it’s coming to an end. I’ve had a ball …,” Senior said in Sydney. Without doubt,one of the nicest guys and wonderful gentlemen that i ever caddied for!Great company to be with. Peter always seems to go that extra yard to help out fellow players, fans and others.